Sheep To Shawl at The Fair! 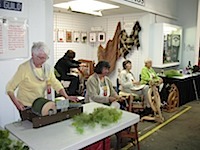 A team of TWG members demonstrating at the Fair -- from SHEEP to SHAWL- 2010. Workshops - each year we have 1-2 workshops. 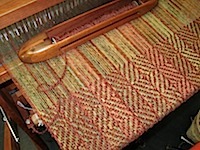 Sheep To Shawl - TWG participates in the Sheep To Shawl Competition each September at The Fair. 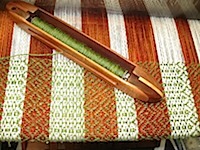 Study Groups - are established for specific areas of weaving or other techniques. Locations at members' homes, unless noted otherwise. 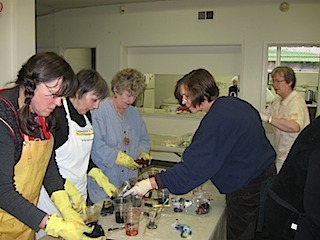 Fiber Fingers Projects Group - Our 4th Friday group meetings are suspended during the relocation of Fibers Etc. Watch this space for new times and new location, coming soon. Tapestry Study Group - 3rd Wednesdays, 11:30am to 2:30pm. 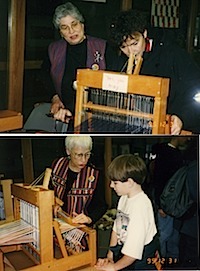 Community Demonstrations - guild members share spinning and weaving activities at schools and public events.